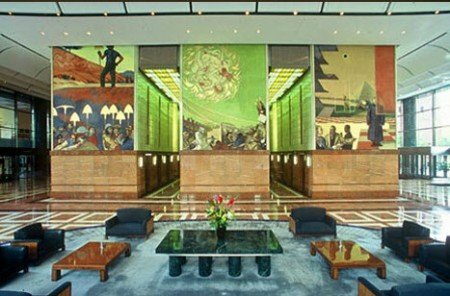 Prominently displayed in the lobby of the Bank of America’s Corporate Center are “creepy” frescoes, filled with occult symbols. Even more unsettling is the fact that those images seem to predict events of a radical world change in the not-so-distant future. 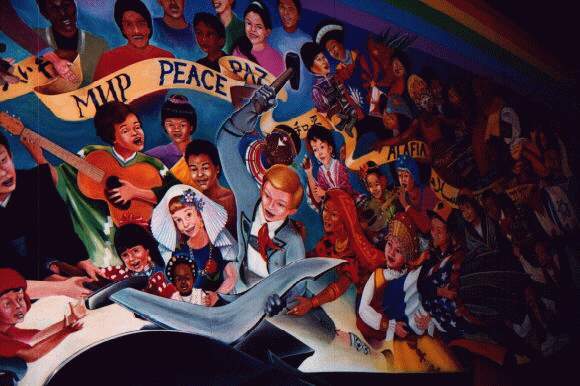 Are those murals predicting the coming of an occult New World Order? 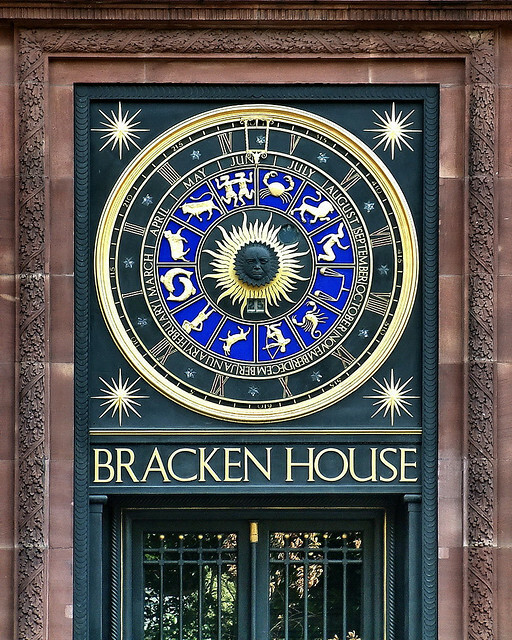 We will look at the occult meaning of the symbols found on the Bank of America frescoes. A reader of Infowars sent me pictures of some very odd murals displayed at the Bank of America Corporate Center in Charlotte, NC. Needless to say they immediately caught my attention, as I was flabbergasted by their symbolism and their message. 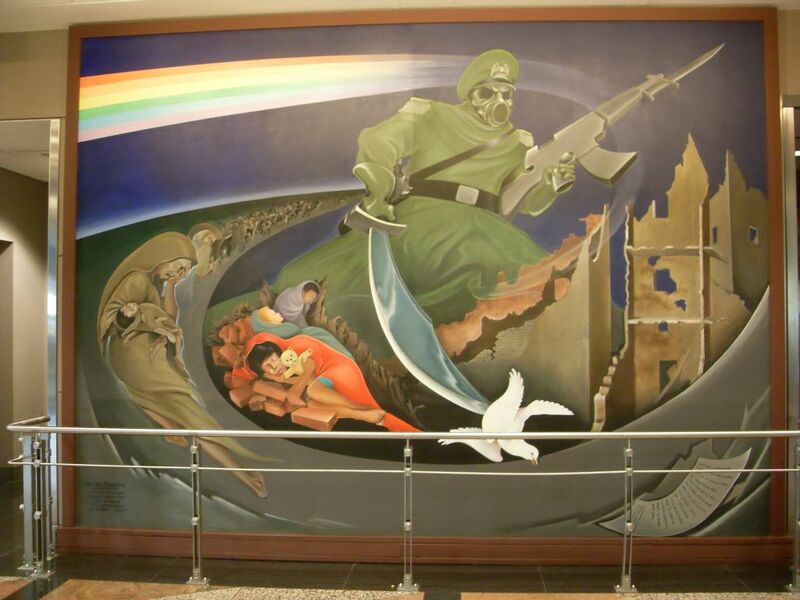 I also couldn’t help relating them to the ominous murals of the Denver International Airport. Painted by Benjamin Long, the paintings are said to revolve around the themes of “making/building, chaos/creativity, and planning/knowledge in a “daring blend of abstract and realism, set off with touches of gold“. 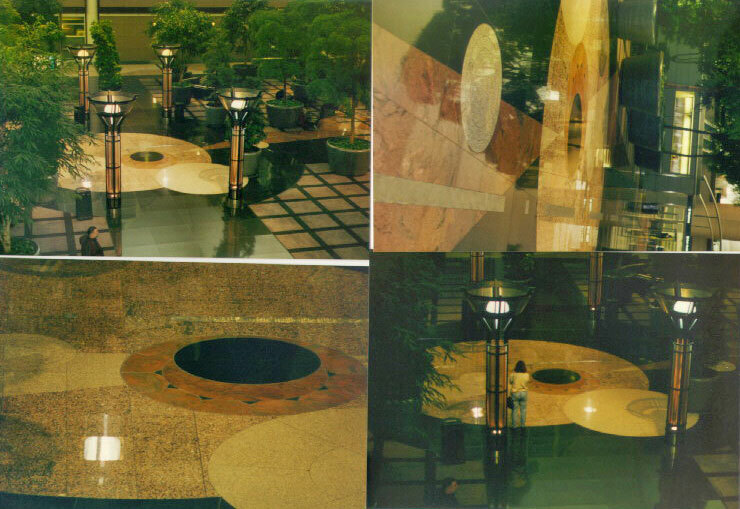 The three frescoes ruling over the lobby of the Bank of America Corporate Center. The fresco on the right is dubbed Planning/Knowledge. An esoteric read of its symbolism reveals exactly what is being planned and what knowledge it is referring to. “Q. On your return to the Lodge, where were you placed, as the youngest Entered Apprentice? Seemingly underneath the boy are people dressed in business suits, seemingly strategizing while pointing at the Masonic boy. Does the boy represent the “new generation”? 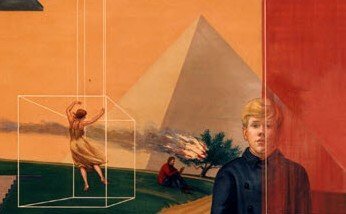 This blond boy is very reminiscent of the blond boy featured at the center of one of the murals of the Denver International Airport. Blond boy hammering a sword into a plowshare. Note that the boy is wearing a traditional Bavarian costume … perhaps as in Bavarian Illuminati? Behind the boy is a tree on fire, which is a reference of the Burning Bush of the Old Testament. The Burning Bush is of great importance in Masonic ritual, especially for the 33rd degree, whose members are considered to be “near the Burning Bush”. 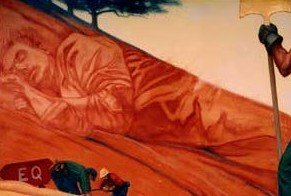 “In the third Exodus it is record that, while Moses was keeping the flock of Jethro on Mount Horeb, “the angle of Lord appeared unto him in a flame of fire out of the midst of a bush”, and there communicated to him for the first time his Ineffable Name. This occurrence is commemorated in the Burning Bush of the Royal Arch Degree. In all systems of antiquity, fire is adopted as a symbol of Deity; and the Burning Bush, or the bush filled with fire which did not consume, whence came forth the Tetragrammaton, the symbol of Divine Light and Truth, is considered in the advanced degrees of Freemasonry, like the Orient in the lower, as the great source of true Masonic light; wherefore Supreme Councils of the Thirty-Third Degree date their balustres or official documents, “near the B.B.” or Burning Bush, to intimate that they are, in their own rite, the exclusive source of all Masonic instruction”. In the background is an Egyptian pyramid, the ultimate symbol of the Mysteries in occult teachings. A strange feature of the painting is the woman apparently trapped inside a transparent cube, hanging from threads coming from the sky. Does she represent the common man, stuck in the confines of the material world (occultly represented by the cube) and manipulated by unseen the forces from above? On the left of the image are stairs, apparently leading to the heavens, a classic symbol representing the path to illumination/Illuminati through the mysteries of Masonry. In the sky is a black sun, another symbol of an esoteric significance. Hermetic traditions teach the existence of two suns, an invisible and etheric one made of pure “philosophical gold” and the material one, the only one the profane can perceive, known as the Black Sun. In alchemy, the black sun (Sol niger) is the name of the result of the first stage of the Opus Magnum. The alchemical Magnum Opus (or Great Work) starts with the “blackening” – the calcination of crude metals – and ends with their transmutation into pure gold. 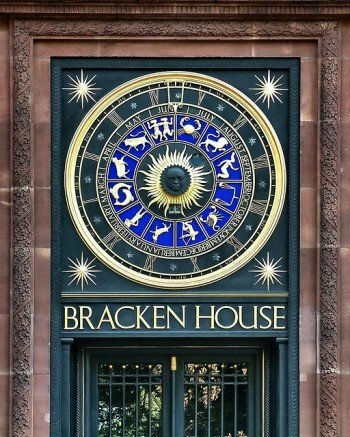 Bracken House, London. The Black Sun beares the face of Winston Churchill. …and, once again, the Denver International Airport. 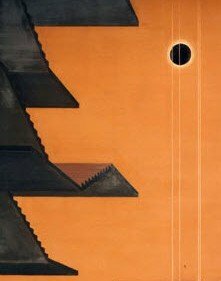 The right fresco therefore seems to portray the first step of a “Great Work” that needs to be accomplished, as symbolically represented by the black sun. Men dressed in suits (one of them oddly looks like Adam Weishaupt), seem to be preparing a new generation of Masonic youth. Meanwhile, the “profane” seem to be idling in an translucent cube, controlled by invisible puppeteers. The middle fresco, Chaos/Creativity, depicts a turbulent transitional period. Many details within the painting describe this profound turmoil, which seem to be affecting all part of society and civilization. 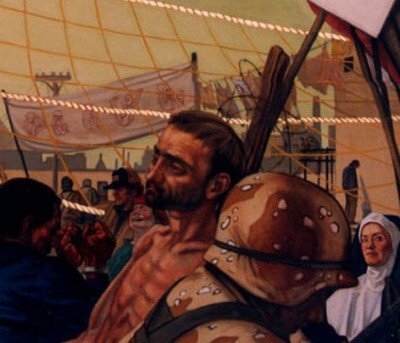 We find military and religious figures, people protesting and much more. Barb wires, nets and soldiers on the streets tell the viewers that this period of turmoil is also one of oppression. The nun does not seem very pleased either. 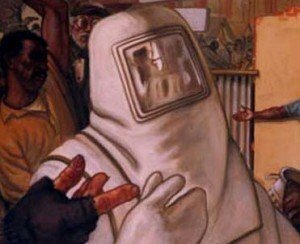 At the left of the painting is a person wearing a biohazard suit, hinting to some kind of chemical warfare. 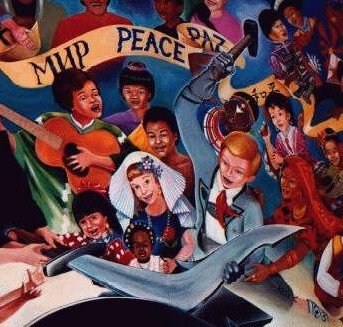 For this reason, and many more, I find this painting very similar to one of the Denver Airport’s murals … the most infamous one. 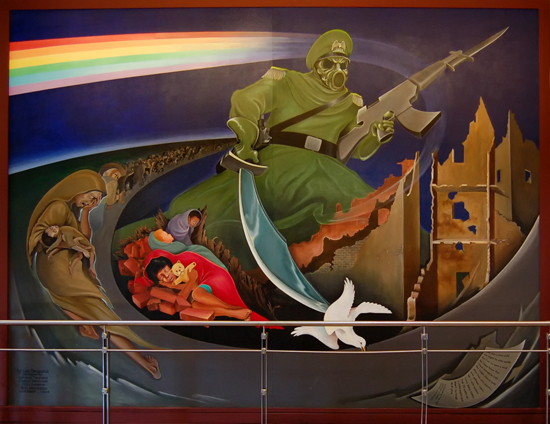 This mural of the DIA portrays a militaristic figure wearing a gas mask and oppressing an endless line of sad people. Chemical warfare, military repression, dead babies … what is there not to like about this image? If we look at the top of the fresco, we see translucent beings spinning with fire, perhaps implying that the turmoil is also happening on a metaphysical, cosmic or astral level. This round fiery shape can also be likened to a sun. Its pale golden color and the transparency of its figures can be associated with the intermediate step of the great alchemical work named “Whitening”. Jung compared this step with daybreak, the preparation for the next and final stage, which is the sunrise, characterized by the color red. Which is, of course, the most prominent color of the left fresco. The fresco on the left is said to focus on the theme of “Making/Building“. 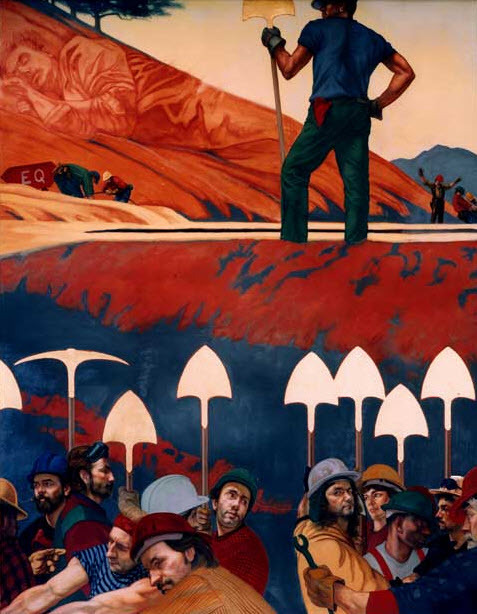 The main figure of the fresco is a worker holding a shovel, contemplating the work done. In his back pocket is a red piece of cloth, a symbolic detail in the context of this image. There is indeed a great emphasis on the color red in this fresco, which, as mentioned above, is the also the color associated with the final step of the alchemical Magnum Opus: Rubedo, the “Red Work”. In occult teachings, alchemical transformation can happen on numerous levels: a material level, where crude metals are transmuted to pure gold, but also on a spiritual and philosophical level, where the profane man becomes a “regenerated man”. In secret-society lore, the entire world is considered to be the subject of alchemical transformation; it is said to be an imperfect plane needing to be “transmuted into gold” in order to mirror the heavens, in accordance with the hermetic axiom “As Above, So Below”. Is a New World Order the “Great Work” of the occult elite? Is he dead or sleeping? And what does “EQ” mean? An odd detail of the fresco is this man blending with the earth, apparently in deep sleep … or is he buried? This is also reminiscent of the (unsettling) sleeping little boy on the DIA murals. What Is The Meaning of the Frescoes? The first fresco displays a wide array of occult symbols, some directly referring to Freemasonry. This is quite astonishing as the painting is in the lobby of the headquarters of the United States’ most predominant bank and not in a Masonic lodge … but perhaps there is some overlap. 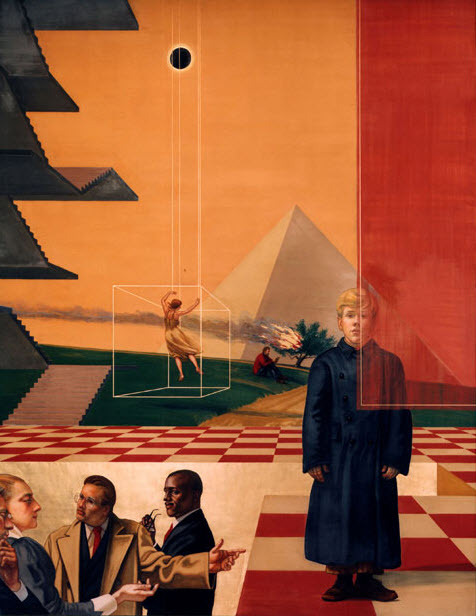 Those who are “in the know” and initiated to the Mysteries are those who are qualified to accomplishing the planning process, which in this painting seem to be the men in suits, whose ties match the red and white checker-board floor, and who make plans for the future generation, represented by the blond Masonic boy. 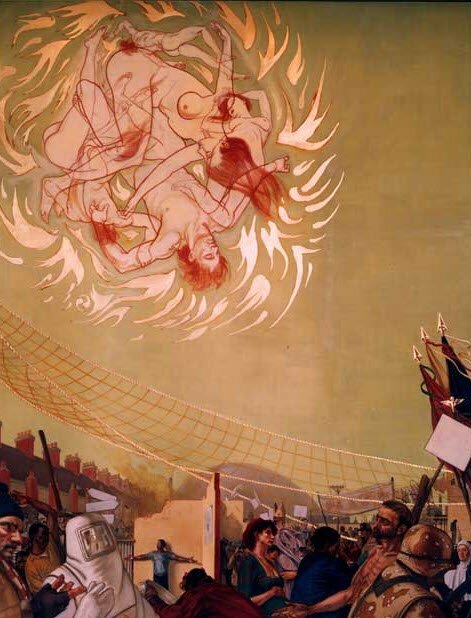 In the second fresco, civil unrest, riots, protests and repression are all taking place. Historically, the masses only usually go into an outright revolt when their living conditions deteriorate significantly or when hugely unpopular policies get adopted. 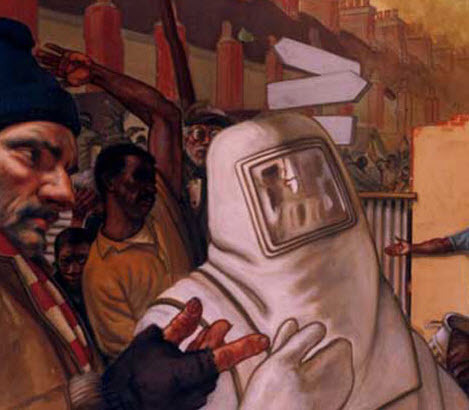 Does this piece refer to the loss of civil liberties and the rise of a police state? 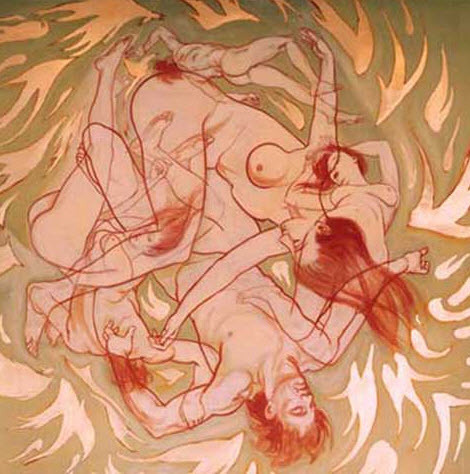 There is also a metaphysical aspect to the image, represented by the spinning naked bodies that appear as the sun, implying that the period turmoil is also happening on a cosmic level. The Bank of America frescoes are yet another example of the elite’s agenda being “hidden in plain sight”. These giant images, on display for all to see, but designed to be understood by few, describe the philosophy of the elite rulers, their occult knowledge and their plans for the future. As it is the case for all works of art, it is possible to interpret these paintings on numerous levels and to come up with different conclusions. It is, however, difficult to ignore the recurrent themes found in the”Sinister Sites” described on The Vigilant Citizen: prevalent occult symbolism, the heralding of a “new era”, contempt for the profane masses, celebration of repression and war, etc. When comparing the Bank of America frescoes with the art of the DIA and the Georgia Guidestones, we can find a definite consistence in their symbolism, their tone and their message. This leads me to believe that the same group is behind all of those sites and many more. Whoever they are, we know a few things for sure: they are extremely rich, extremely powerful and they don’t really like you … because you are not one of Them. This entry was posted on July 30, 2011 at 11:57 PM	and is filed under The Esoteric Agenda of Humanity. Tagged: Bank of America, Bank of America Corporate Center, Business, Denver International Airport, eerie depictions, esoterism, Frescoes Murals Faux-Finishes, hidden symbols, Mural, Needless, new world order, occultism, Paint, signs. You can follow any responses to this entry through the RSS 2.0 feed. Responses are currently closed, but you can trackback from your own site.